St. Bernard Parish Government (SBPG) will auction four properties this Thursday, November 8 at 4pm in the Council Chambers (8201 W. Judge Perez Dr.). Doors open at 3pm for registration (free). Opening bids start at 50% of appraised value. 2523 Hopedale Hwy and 2245 Bayou Rd are being sold without restrictions. 1950 & 1966 Benjamin St. are being sold through the Buy & Build Program and are required to follow program requirements. Since 2245 Bayou Rd is the only property with a house located on the site, the house will be available to view this Wednesday from 1-4pm. This auction will feature four (4) properties. Legal description: Lot A-2 Doullut Subdivision to Alluvial city. The parcel number of the property is E00000010008. Legal description: Lot 50 Whitehall 40X150. The parcel number of the property is E00000011636. Legal description Lot 46-A SQ. E, St. Claude Heights, The parcel number of the property is E00000010156. Legal description: Lot 53-A, SQ E, St. Claude Heights Subdivision. The parcel number of the property is E00000010021. The bidding on the 2523 Hopedale Hwy property will open at the minimum bid of $12,500. The bidding on 2245 Bayou Rd. property will open at the minimum bid of $37,500. The bidding on 1966 Benjamin property will open at the minimum bid of $30,000. The bidding on 1950 Benjamin property will open at the minimum bid of $25,000. The deposit must be a personal check, cashier’s check, or money order. All properties are sold “as is, where is” condition and will close within 30 days. A 10% deposit will be required for the winning bid of the property sold. Chalmette, LA – On October 22nd, hundreds of adults and children were in attendance for the Sidney Torres Park Ribbon Cutting. Parish President Guy McInnis and the St. Bernard Parish Council celebrated the improvements to the park including a new state-of-the-art playground, fitness zone and skate park. These improvements will play an important role in the revitalization of the adjacent neighborhoods and provide additional recreational outlets for our youth. During the ceremony President McInnis recognized Polly Campbell and the many volunteers who built the original playground and the Torres family for their generous contributions to the park. Cypress Pop Trio performed following the ribbon cutting. St. Bernard Parish Government Officials thanks everyone for attending and especially McDonald’s, State Farm Insurance Agent Cindi Meyer and the Law Offices of Sidney D. Torres for providing refreshments for the event. Chalmette, LA — The St. Bernard Parish Home Mortgage Authority will host a FREE Home Buying Seminar on Wednesday, November 14, 2018 at 6:30 p.m. in the St. Bernard Parish Council Chambers located at 8201 W. Judge Pere Drive in Chalmette. Doors will open at 6:00 p.m. and seating is first come, first serve. Presenters at the seminar will include Mr. Maher of CrossCountry Mortgage, fellow board member Jacques Alfonso of St. Bernard Realty, Amber Ruiz of Greg Ruiz Insurance, Henri Dazet of Title Corp of Louisiana, James Williams of 360 Home Inspections and Will Cummings of Southern Builders of Louisiana. “We thought it was important to have people who are from St. Bernard and work in St. Bernard at the seminar to provide the knowledge of what it takes to buy a house down here” said Maher. Each of the presenters will be raffling off a door prize worth at least $50 as a bonus for everyone in attendance. Chalmette, LA – Parish President Guy McInnis and the St. Bernard Parish Council would like to invite the public to attend a ribbon cutting ceremony on Monday, October 22nd at 4:30 p.m. This event will highlight our new playground, fitness zone and skate park. These improvements will play an important role in the revitalization of the adjacent neighborhoods and provide additional recreational outlets for our youth. Cypress Pop Trio will be performing following the ribbon cutting. Light refreshments will be provided by McDonald’s, State Farm Insurance Agent Cindi Meyer and the Law Offices of Sidney D. Torres. 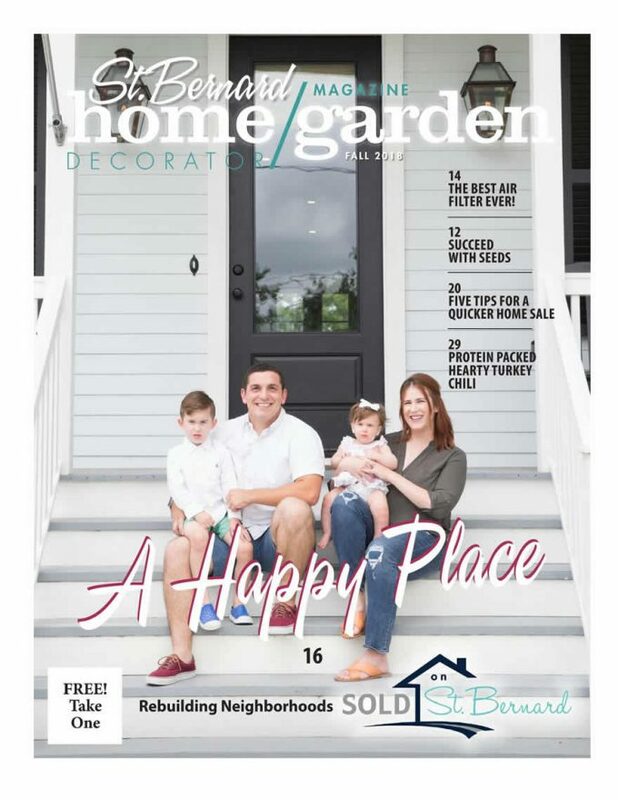 Sold On St. Bernard is featured on the cover of St. Bernard Home and Garden Magazine as well as on internal spreads. If you’re considering buying a new home, check out the St. Bernard Buy and Build Program. The new program allows you to pick your builder, pick your lot and design your dream home – your way!